Hi! My name's Allie, I'm 24, and I'm from Liverpool in the UK. 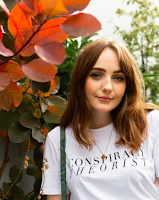 As a wannabe fashion student, I started this blog in 2012 to help me get into uni and give me a bit of a creative outlet, and now, I have that fashion degree, plus a masters in digital marketing. I'm a little more ~grown up~ than I was when I started this blog, but I still blog about my outfits and my travels around the world. Join me on this lil journey of mine on twitter and Instagram @allie_davies and say hi! i have hetrochrochima i have 1 lue and brown and my other one is brown with the smalllest amount of blue ever ! i am not alone in this world !